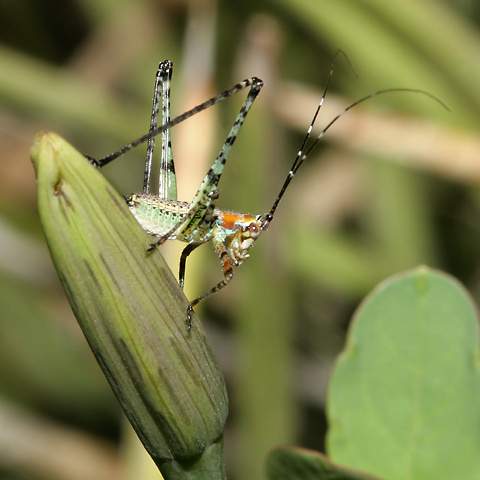 I spotted several of these small katydid nymphs when I was photographing flowering dodder vines this last September here in Tucson. I don't know what species of katydid they are. 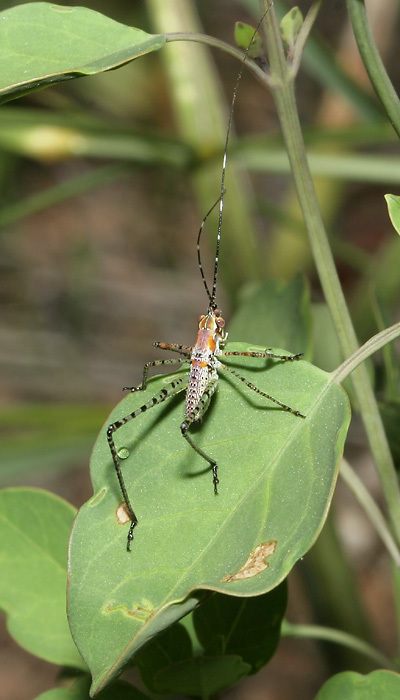 I have seen Creosote Bush Katydids (Insara covilleae) and Elegant Bush Katydids (Insara elegans) here in Tucson, but these look nothing like them. I can tell that these small insects are katydids and not grasshoppers because of their very long antennae. I also can tell that they are nymphs because they lack the wings of adult katydids. Nymphs in Greek mythology are female nature spirits, often depicted as beautiful young females in art with a classical theme, but nymphs are also the immature forms of insects that undergo incomplete metamorphosis like Katydids (Family Tettigoniidae). In insects with incomplete metamorphosis, the immature forms look somewhat similar, but not identical to the adults. Young katydid nymphs are roughly similar in shape to the adults, but they are smaller and often brighter colored or differently patterned than the usually green or brown adults, and they lack the adults' wings and other characteristics. The immature forms of insects with complete metamorphosis look completely different than the adults, such as caterpillars which transform into butterflies.